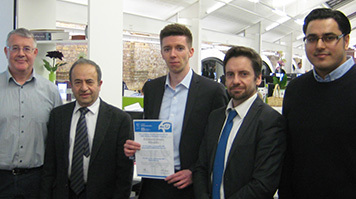 Mechanical engineer and London South Bank University (LSBU) Masters graduate Richard Hendry has received an international award for his dissertation in building energy modelling from the Chartered Institute of Building Service Engineers (CIBSE). His final project looked at the energy consumption of buildings and the disparity between the predicted efficiency and actual energy use and received third prize, behind Masters students in Germany and Japan, from the CIBSE Building Simulation Group. Richard studied his Building Services Engineering Masters at LSBU while working for Troup Bywaters + Anders as a design engineer and was encouraged by his lecturer to submit his dissertation, Applying building energy modelling tools to operational energy use, for the award. "I achieved a distinction grade for my dissertation and following that one of my lecturers informed me about the CIBSE building simulation group award, and suggested I enter,” Richard said. “Recognition of my work from a body such as CIBSE really means a lot, and will no doubt assist me in my career. LSBU is a top Modern University in London for research in General Engineering (REF 2014), and half of our students study part-time and are employer-sponsored.